There are certain names we recognize when we think of baby products, and then there are some that are newer to the market. 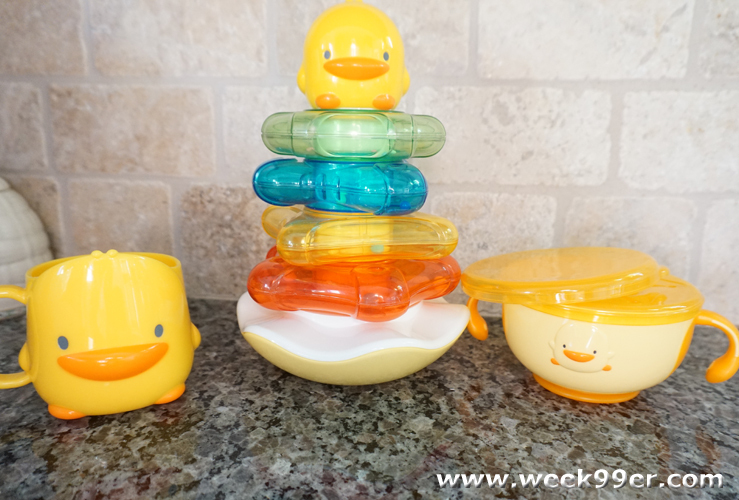 One of the newer lines in the US is Piyo Piyo, an adorable line of products that are created to not only be useful, but are BPA and Phthalate free but also environmentally friendly and durable. The Toy gift set is packed with three toys, and only costs $26. 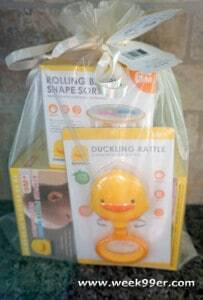 Inside the Toy Gift Set is the Piyo Piyo Rocking Rattle Stacker, the Piyo Piyo Rolling Barrel and the Piyo Piyo Duckling Rattle. 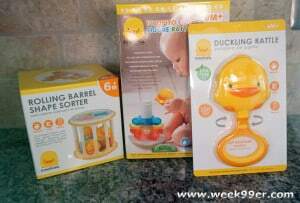 The classic toys that babies and toddlers play with are updated with the adorable duckling design. Each toy helps with a different part of learning and can help your child with hand coordination, matching and even audio development. Inside the Toddler Feeding set is everything a parent or grand parent needs to keep on hand for a quick meal or snacks. 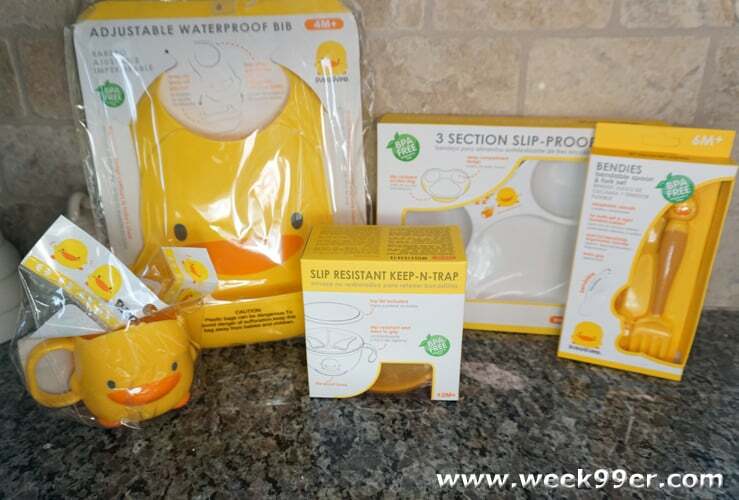 You will find the Piyo Piyo Slip-Proof Three-section Dining Plate, a Piyo Piyo Stylish Bendable Spoon and Fork Set, a Piyo Piyo Cup, the Adjustable Waterproof Bib with Food Catching Tray and a Piyo Piyo Keep-N-Trap with a seal-able lid. The whole set only costs $30, and is well worth the money. The parts should be washed by hand, which may be one of the drawbacks of the set, but is relatively minor. 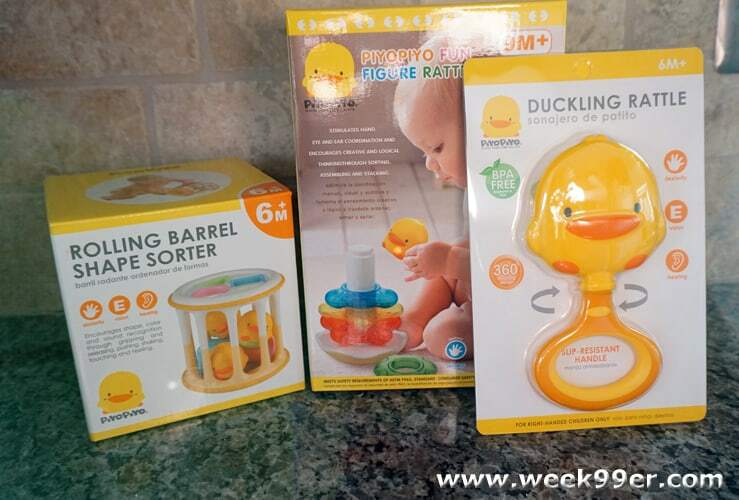 All of the Piyo Piyo toys and feeding products were sturdy and made with environmentally friendly products. Throughout both sets, there was only one issue I found and it was a minor one. 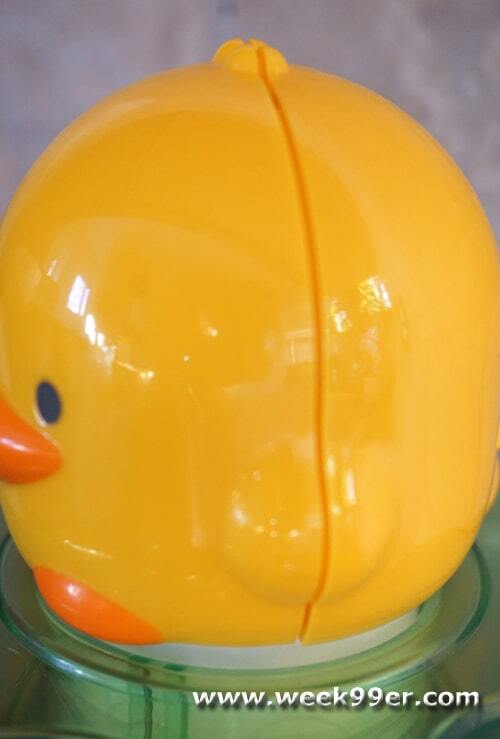 The duckling on top of our stacker toy didn’t fully close. The two pieces just had an air gap between them, but it wasn’t big enough for anything to get in or anyone to get hurt on. Every other product was perfectly formed and made with children in mind. Piyo Piyo sells their products in over 20 countries and are making children and parents smile along the way. I will admit, the Piyo Piyo gift sets had me at just the adorable duckling they use in their design – but the products are made to a standard I’d expect and want for our little ones. You can find the Piyo Piyo Toy Gift Set and the Piyo Piyo Toddler Feeding Set on Amazon, or on the Piyo Piyo website. They are perfect for any new or expecting parents.